Maybe some day, depression and anxiety could benefit from good vibrations. 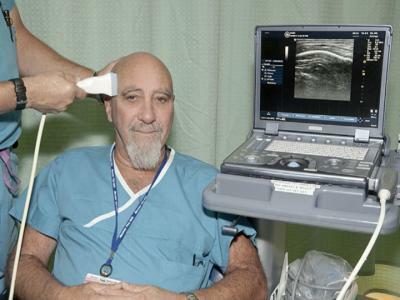 Dr. Stuart Hameroff, professor emeritus of the University of Arizona's departments of anesthesiology and psychology, is lead author of what they call the first clinical study of brain ultrasound. Hameroff became interested in applying ultrasound to the human brain when he read about a study by colleague Jamie Tyler at the Virginia Polytechnic Institute, who found physiological and behavioral effects in animals of ultrasound applied to the scalp, with the waves passing through the skull. "I said to my anesthesiology colleagues, 'we should try this on chronic pain patient volunteers.'" His colleagues respectfully suggested he try it on himself, first. Hameroff acquiesced. "I put it down and said, 'well, that's not going to work,'" he said. "And then about a minute later I started to feel like I'd had a martini." Patients reported improvements in mood for up to 40 minutes following treatment with brain ultrasound, compared with no difference in mood when the machine was switched off. The researchers confirmed the patients' subjective reports of increases in positive mood with a Visual Analog Mood Scale, or VAMS, a standardized objective mood scale often used in psychological studies. "Encouraging!" Hameroff remarked. "We're referring to transcranial ultrasound as 'TUS,'" he added. "This was a pilot study that showed safety, and some efficacy, for clinical use of TUS," Hameroff said. "Because important structures called microtubules in all brain neurons vibrate in the ultrasound range, and help mediate mood and consciousness, TUS may benefit a variety of neurological and psychiatric disorders." The discovery may open the door to a possible range of new applications of ultrasound in medicine. "We frequently use ultrasound in the operating room for imaging," said Hameroff. "It's safe as long as you avoid excessive exposure and heating." The mechanical waves, harmless at low intensities, penetrate the body's tissues and bones, and an echo effect is used to generate images of anatomical structures such as fetuses in the womb, organs and blood vessels. Additionally, the high-frequency vibrations of ultrasound, which far exceed the range of human hearing and are undetectable when passing through the body, may be more desirable than existing brain stimulation techniques such as transcranial magnetic stimulation, or TMS. Used to treat clinically depressed patients, TMS can have side effects including what some describe as an unpleasant sensation of magnetic waves moving through the head. After finding promising preliminary results in chronic pain patients, Hameroff and his colleagues set out to discover whether transcranial ultrasound stimulation could improve mood in a larger group of healthy volunteer test subjects. 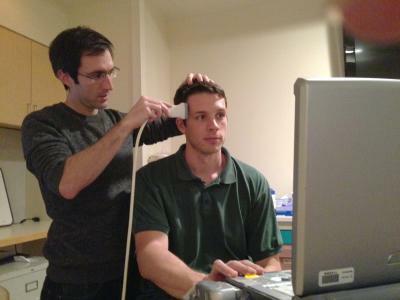 Jay Sanguinetti, a doctoral candidate in the department of psychology and his adviser John Allen, a UA distinguished professor of psychology, were intrigued by Hameroff's idea of testing ultrasound. They conducted a followup study of ultrasound on UA psychology student volunteers, recording vital signs such as heart rate and breath rate, and narrowed down the optimum treatment to 2 megahertz for 30 seconds as the most likely to produce a positive mood change in patients. "With 2 megahertz those who were stimulated with ultrasound reported feeling 'lighter,' or 'happier;' a little more attentive, a little more focused and a general increase in well-being," Sanguinetti said. Allen and Sanguinetti then began a double blind clinical trial to verify the statistical significance of their findings and to rule out any possibility of a placebo effect in their patients. Results of the trials are being analyzed, Sanguinetti said. "What we think is happening is that the ultrasound is making the neurons a little bit more likely to fire in the parts of the brain involved with mood," thus stimulating the brain's electrical activity and possibly leading to a change in how participants feel, Sanguinetti said. The UA researchers are collaborating with the Silicon Valley-based company Neurotrek, which is developing a device that potentially could target specific regions of the brain with ultrasound bursts. The UA researchers will work with a prototype of the Neurotrek device to test its efficacy and potential applications. Said Sanguinetti: "The idea is that this device will be a wearable unit that noninvasively and safely interfaces with your brain using ultrasound to regulate neural activity."